STONE BENCHTOPS Brisbane, Sunshine Coast, Gold Coast by Stone Concepts QLD - Marble, Granite & Reconstituted Stone Bench tops. Stone Concepts Queensland have been established in the same location at 3/15 Lear Jet Drive, Caboolture for the past 10 years. 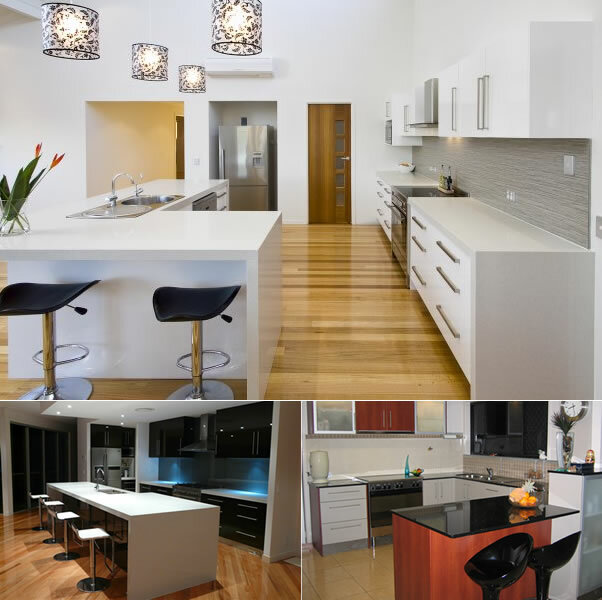 We specialise in kitchen STONE BENCHTOPS – natural and reconstituted stone products from various suppliers such as Caesarstone, Smartstone, Quantum Quartz, Essastone, Silestone, TrendStone, etc. as well as the variety of natural marble and granites. These products are not only extremely attractive and highly sought after by designers and architects but the pricing is now an elegant alternative to laminate post-formed benches of the past. There is a very extensive range of colours and patterns to suit all tastes. The products are resistant to stains, cracks & scratches and are heat-resistant, and all reconstituted stone suppliers provide product warranties. Our goal at Stone Concepts QLD is to provide you with courteous, expedient, professional service of the highest standard. The Stone Concepts staff are experienced and reliable and are able to answer all your questions. Whether you need bench tops for your new home or renovation, business, shop fit-outs, we have what you need at prices to meet your budget. We cut, polish and install! We don’t use contractors so you will have the same tradesman on your job from start to finish. IF YOU WANT THE ‘WOW’ FACTOR YOU HAVE TO STONE BENCHTOPS! Browse our Stone Concepts Website for more information. If you have any questions or would like to speak to us, please Contact Us. At STONE CONCEPTS QLD PTY LTD, the customer always comes first. We are the Best in marble, granite & reconstituted stone (engineered stone) Bench-tops (counter-tops). Working with you, not just for you!